Kaloy Sanchez (middle) flanked by (L-R) First Secretary and Consul Catherine Torres, Charge d´Affaires Lillibeth V. Pono, Arndt Art Agency founder Matthias Arndt and Cultural Attache Mylah Rubio at the Opening of “No Exit”. Photo by Hannes Wiedemann/Arndt Art Agency. 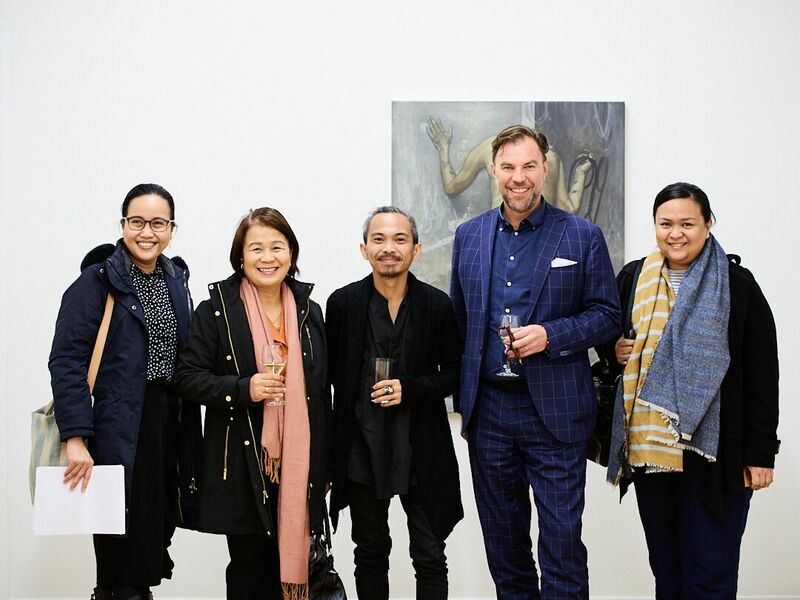 Berlin – Arndt Art Agency, a staunch supporter of Philippine contemporary art, opened “No Exit” on 21 March 2018 featuring commissioned works by Philippine visual artist Kaloy Sanchez. The vernissage was attended by around 100 of the gallery´s patrons, including officials of the Philippine Embassy led by Chargé d’Affaires Lillibeth V. Pono. Photo by Hannes Wiedemann/Arndt Art Agency. 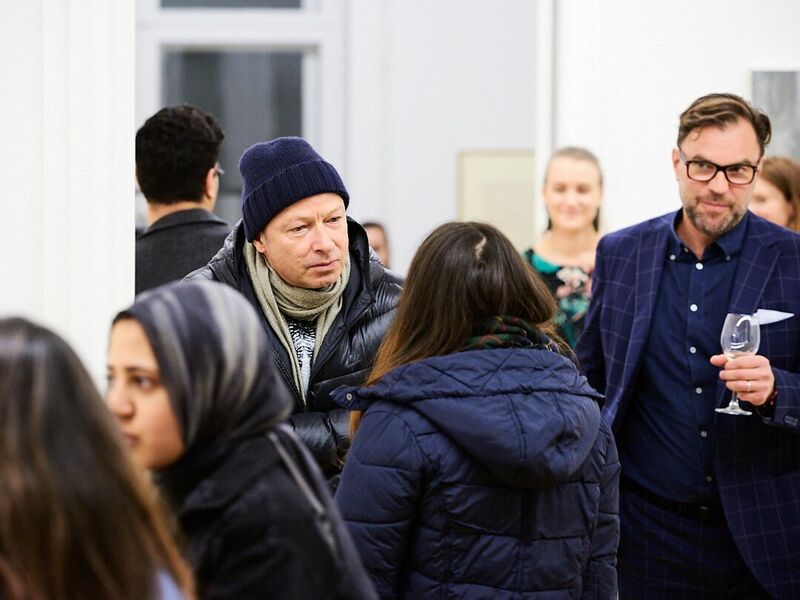 After the exhibit, the Embassy sat down with the artist to pick his thoughts about the show and his first visit to Berlin. Could you explain your show ‘No Exit’ to us in a way that wouldn’t give us a nosebleed? “No Exit” started as an homage to Jean-Paul Sartre’s existential play of the same title. Sartre’s mundane depiction of Hell as an eternal confinement in a room with two other souls, inescapable to each other’s gaze and objectification, was paralleled to my practice in the studio with my sitters/models, letting them be in their candid selves, as I deduce their form into lines and shapes, and in the end coming up with a body of work that not only shows an objectified study of the human form but also an introspection of the self, others, and the human condition. This was your first visit to Berlin. What was your impression of the local art scene? I have always dreamt of going to Berlin, and my first impression was, if not more, how I imagined it to be, vibrant and thriving, and I think Berlin has the most critical audience of art around. While you were in town, you met a German artist you admire. Tell us about that. I had an opportunity to visit König Galerie with Matthias Arndt to see Monica Bonvicini’s sculptural pieces among others, and while I was there I was introduced to Anselm Kiefer by Johann König, at first I wasn’t fully aware of my good fortune, I guess because of the amount of works that I have to digest, but as the reality of the situation hit me, I soon found myself speechless like anyone who has been awed and star-struck, trying to hide the excitement off my face. (I own a book about this guy! And it’s one of my favorites.) Although O wasn’t able to talk to him longer than the opportunity allowed, I consider that chance encounter as one of the highlights of my trip to Berlin, as he is one of those artists that I look up to. Guests at the vernissage of „No Exit“. Photos by Hannes Wiedemann/Arndt Art Agency. 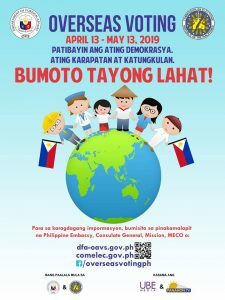 Kaloy Sanchez was born 1982 in the Philippines. He studied at the University of Philippines, Diliman and holds a BFA, Major in Studio Arts. Recent solo exhibitions of the artist include “Oh the Unspeakable Things”, at ARNDT Singapore, Singapore (2014), “Nausea”, at West Gallery, Quezon City, Philippines (2013) and “Ring Around the Rosie”, Manila Contemporary, Makati City, Philippines (2012). 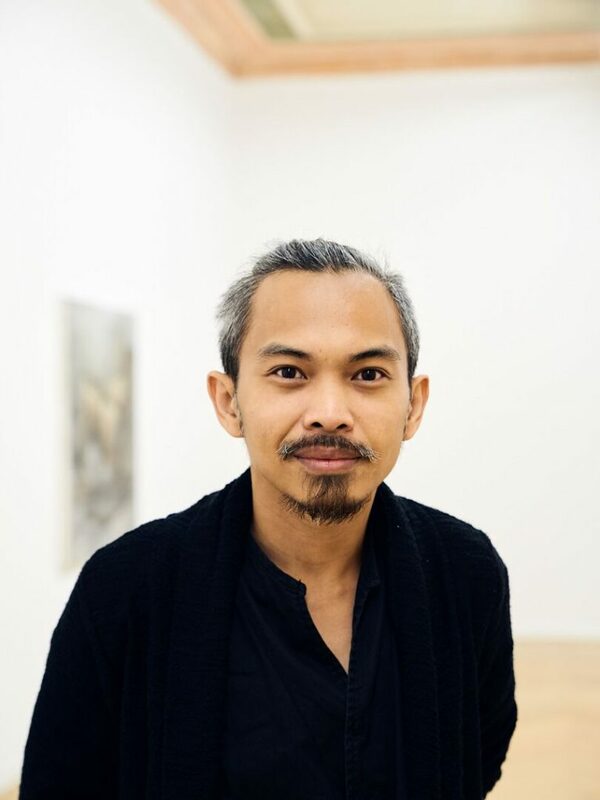 He has also participated in numerous group shows such as “Manila: The Night is Restless, The Day is Scornful”, ARNDT Singapore, (2014), “Secret Rooms & Hidden Motives by Jason Montinola and Kaloy Sanchez”, Valentine Willie Fine Art, Kuala Lumpur, Malaysia (2012) and “Imagining Identity: 100 Filipino Self Portraits”, Finale Art File, Makati City, Philippines (2012).